JBL has a long history of delivering headphones that punch above their price range. Sure, JBL headphones aren’t necessarily the best sounding headphones out there, but they’re arguably the best-sounding for their price, plus they offer cool features like Google Assistant integration, a nice design, and more. Now, the company is unveiling a new line of JBL headphones — JBL Live — starting with the JBL Live 650BTNC headphones. The new cans boast noise cancellation, a nice, friendly design, and more. But are they worth the $199.95 price tag? We put JBL’s latest flagship headphones to the test to find out. The JBL Live 650BTNC headphones are unmistakably JBL when it comes to their design — and not just because of the large JBL logo that you’ll see on the ear cups. They also feature a nice fabric headband, and come in colors that you would expect from JBL — like the nice dark blue. They’re also available in black and white. On the left ear cup, you’ll find a MicroUSB port for charging, which was very disappointing to see. If you’re like me, you’re looking forward to the day when you can have one single charging cable for your computer, phone, and accessories — and the connector that JBL should have adopted in 2019 is USB-C. On the right ear cup, you’ll get volume and playback controls, a power switch, aux input, and a button to turn on and off noise cancellation. Generally, the JBL Live 650BTNC headphones look good, and feel good. They’re largely built from plastic, but they don’t feel cheap or weak, and should withstand most day-to-day abuse. In the box, apart from the headphones themselves you’ll get a MicroUSB charging cable, aux cable, and a canvas carry pouch. 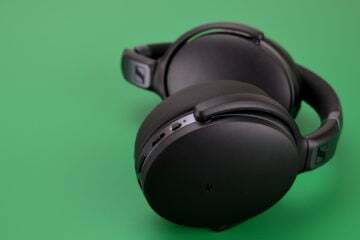 We would have liked to see a stronger case for these headphones — especially given their price range and the fact that they offer noise cancellation, and as such might be used for travel. The JBL Live 650BTNC headphones don’t just look good — they’re also relatively comfortable. They feature plenty of padding around the ear cups and under the headband, and they’re not overly heavy, which is helpful for wearing them for extended periods of time. There are a few comfort quirks to keep in mind. For starters, the headphones have a relatively heavy clamp, though we found that it was easy to get used to after listening for a while. After you get used to them, you should be able to wear them for extended periods of time without them getting overly uncomfortable. Ultimately, the most important thing is how the JBL Live 650BTNC headphones sound — and thankfully, they sound pretty good. The bass response on the headphones is pretty good — but it’s not overpowering. Many listeners will prefer that, while some will prefer a heavier bass response, but the fact is that these headphones tend to emphasis the high-end, especially when noise cancellation is disengaged. When noise cancellation is engaged, the headphones sound quite a bit warmer and a little heavier on the bass. The mid range also changes pretty significantly depending on whether or not noise cancellation is on. When it’s on, the low mids are a little heavier, making for a warmer sound in general, while the high mids are a little less prominent. When noise cancellation is off, low and high mids switch — there are a little more highs and a little less lows. The high end response in general is pretty good on these headphones. Without noise cancellation, high end is the most prevalent aspect of the headphones’ frequency response, making for a generally clear and detailed sound. Arguably, with noise cancellation off, the headphones put a little too much emphasis on the high end. When noise cancellation is on, the high end is a little more tame, and we think it makes for a better listening experience overall. As mentioned, the JBL Live 650BTNC have noise cancellation, and it’s not bad. It’s not quite as good on these headphones as it is on the Bose QuietComfort 35 II headphones or on the Sony WH-1000XM3 headphones, but it’s still pretty good — and we found could easily cut out engine drones and other noise pretty effectively. The JBL Live 650BTNC headphones connect to your listening device through Bluetooth 4.2, and as such you’ll get a listening range of up to 10 meters, or 33 feet. We found that the headphones seemed to connect perfectly well — we never really experienced any major skips or jumps while using the headphones. When it comes to battery life, the headphones offer a pretty decent 20 hours with noise cancellation on, and 30 hours with noise cancellation off. That’s pretty good — and means that the headphones should get you through a long day of travel. JBL has hit another home run with the JBL Live 650BTNC headphones. Not only do they look pretty good, but they’re also comfortable and sound pretty good too. Noise cancellation is an added bonus, too. But are they the best noise cancelling headphones in their price range? Well, they’re at least a solid competitor. The Audio Technica ATH-ANC700BT headphones are another great option. The best noise-cancelling headphones under $200, however, are probably the Sennheiser HD 4.50 BTNC headphones, which sound slightly better, despite the slightly lower battery life. Still, these are excellent headphones, and because of their excellent value for money we’ve awarded them the Headphone Review Silver Medal.